The conservation group The National Wildlife Federation says global warming is threatening millions of waterfowl in the Prairie Pothole Region, the vast wetlands area that extends through parts of Minnesota, the Dakotas and Canada. The organization has released a report that says within 75 years, most of the Prairie Pothole Region could disappear due to drought and evaporation. St. Paul, Minn. — The Prairie Pothole Region is often referred to as North America's "duck factory" because it's such a significant breeding ground. The area is dotted with millions of shallow pools and depressions that are filled with water in the spring. It's an ideal habitat for many nesting ducks and other migratory birds. But the National Wildlife Federation says that habitat is in serious trouble. The organization predicts that most wetlands in the region will disappear if they're exposed to prolonged global warming. Spokesman Marc Smith says the findings are startling. "By 2080 up to 91 percent of the Prairie Potholes, for example, in Minnesota, North and South Dakota and just north in Canada could dry up, thanks to warmer, drier weather," Smith says. The report says Minnesota could see as much as a 69 percent decline in breeding duck pairs. That may sound extraordinary, but it's not shocking to wildlife biologist Ray Norrgard, with the Minnesota Department of Natural Resources. 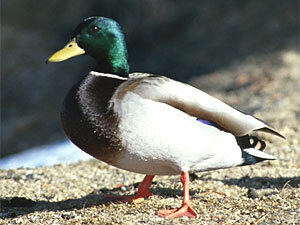 He says ducks are extremely sensitive to habitat changes. Norrgard says it's no secret that ducks are not that fond of the state's habitat these days. Minnesota hunters complained that last fall's duck hunt was the worst in recent memory. "In Minnesota we have what has been billed as kind of a waterfowl crisis, if you will. We certainly are in trouble in terms of waterfowl habitat right now, have been in trouble for really a pretty long time," says Norrgard. Norrgard says there are a lot of reasons why Minnesota's duck habitat is declining. And he thinks the prospect of global warming will just add to the problems. "The National Wildlife Federation report, I think, points out that in addition to the things that we're dealing with now -- loss of wetlands to drainage, loss of wetlands to development, we've also got this larger issue on the horizon that we're going to have to try to find ways to wrestle with," says Norrgard. There's still a lot of debate about the extent of global climate change and what's causing the problem. But the National Wildlife Federation believes carbon pollution from burning fossil fuels, like gasoline in cars and coal in factories, is the primary culprit. Marc Smith says the global temperature in the last 100 years has risen by an average of 1 degree Fahrenheit. He says carbon gas emissions during that same time period have surged. "In the past 100 years our carbon dioxide has increased in the atmosphere about 30 percent. A lot of experts agree that that is the single largest issue that is the cause of global warming," says Smith. But not everyone does agree on this point, which makes the National Wildlife Federation's challenge to reduce global warming even more daunting. For now, the organization is focusing on a narrow list of recommendations. It wants Congress and the president to put stricter limits on carbon pollution, and the group wants tougher enforcement of the federal Clean Water Act. The National Wildlife Federation also wants states like Minnesota to do more to protect sensitive habitat areas. The federation's affiliate on the state level is the Minnesota Conservation Federation. That group is trying to get the Legislature to approve a Clean Water fee assessed on residential and business sewer hookups that would help pay for cleaning up the state's rivers, lakes and wetlands.